With its waterways and historic architecture, Venice (Italy) is a uniquely beautiful city. This webpage is a compilation of our best photos of Venice. This first photo is from the top of the bell tower of San Giorgio Maggiore, which is the best vantage point for panoramic photos of Venice. In the foreground we can see San Giorgio Maggiore's unpainted octagonal-sided white stone lighthouse and a breakwater protecting the marina on the north. In the background on the left is the San Marco bell-tower and the Doge's Palace, on the far right is the church of San Francesco della Vigna. 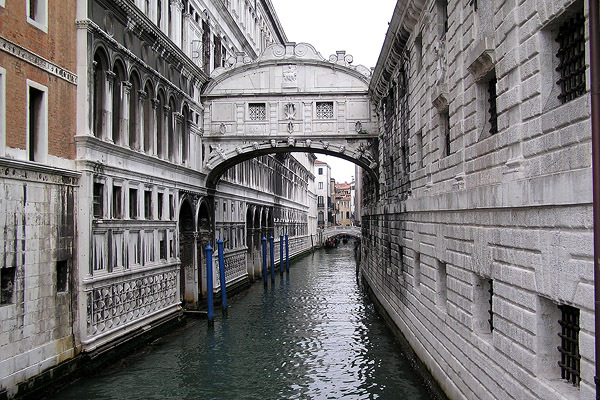 Water from the Grande Canal spills onto the Campo della Pescaria (fish market). The Ca' Pesaro on the Grande Canal is a marble palace completed in 1710, and today serves as Venice's museum of modern art. Completed in 1743, the chiesa di Santa Maria del Rosario (church of Saint Mary of the Rosary), commonly known as the chiesa dei Gesuati (Church of Jesus), is situated in the Dorsoduro area of Venice on the canale della Giudecca. The Doge's Palace (elected for life by the aristocracy, the Doge was the chief magistrate of Venice) on Saint Mark's Square, as seen from the top of the bell tower. Built in 1225 for the personal use of Giacomo Palmieri, the Fontego dei Turchi (Warehouse of the Turks) obtained its name when in 1621 it was leased to Ottoman merchants to serve as a warehouse. A visit to Venice is not complete until one has been on a gondola ride. And if you're looking for eternal love, legend has it that a kiss on a gondola ride at sunset under the Bridge of Sighs will do the trick. The Procuratie Vecchie on Saint Mark's Square in Venice (the right hand photo is taken from the top of Saint Mark's bell tower). Originally built in the 12th century to house the procurators (the highest position in the magistracy after the Doge), they were rebuilt to 3 storeys after a fire in the 16th century. Venice's famous Rialto Bridge, the oldest (current version completed in 1591) of four bridges crossing the Grande Canal. In the foreground is a water taxi (vaporetto). 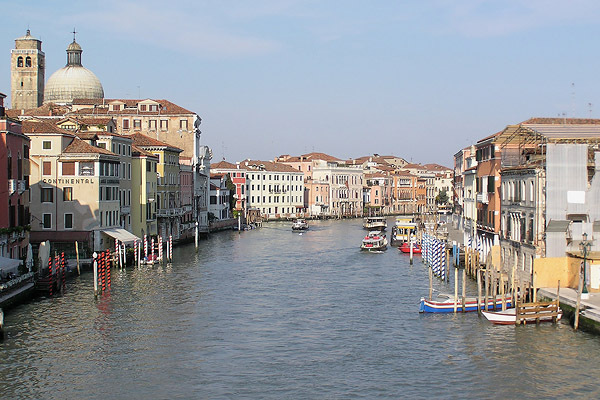 The view along the Grande Canal from Venice's Rialto Bridge. Saint George watches over Venice from his vantage point at the top of the dome of the church of San Giorgio Maggiore. Saint Mark's Basilica (completed 1063) on Saint Mark's Square in Venice. The church of San Francesco della Vigna (completed 1554) towers above all else. In this church Doge Andrea Gritti is buried in front of the high altar (he paid 1000 ducats for the privilege). In this photo taken from the bell tower of San Giorgio Maggiore, we can see the Piazza San Marco, with the bell tower of Saint Mark towering above all else. On the right is the Doge's Palace. This view over Venice shows the shadow of Saint Mark's bell tower (from which the picture was taken) over the Procuratie Vecchie, with Saint Mark's Clocktower on the right. Whilst the Grande Canal is the most prominent, Venice is packed with smaller canals like this one. X10A_Freedom had a better time on his second day in Venice - to kick the day off he boated into Zattere, Venice, a much better way to get in to Venice than to bus in. He saw the Accademia Bridge (which he described as the prettiest of the 4 bridges crossing the Grande Canal), Piazza San Marco (where he was awestruck about the views from the top of the Campanile), Cafe Florian, the Bridge of Sighs (see photo below), Arsenale Vaporetto, East Castello (his favourite part of Venice, due to the lack of tourits), the public gardens, Santa Sofia and Palazzo Contarini del Bovolo. His tip for the best buy in Venice - cold full cream milk! 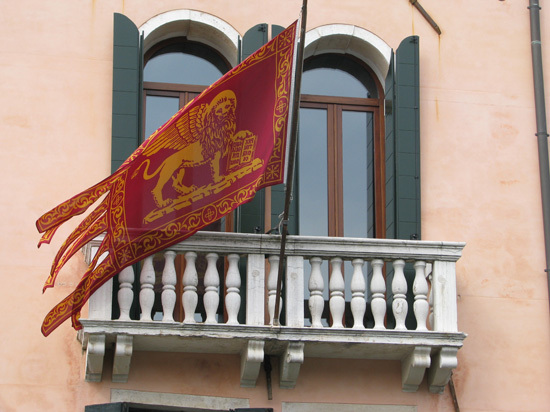 Patricia visits 3 islands near Venice - Murano, Burano & Torcello. 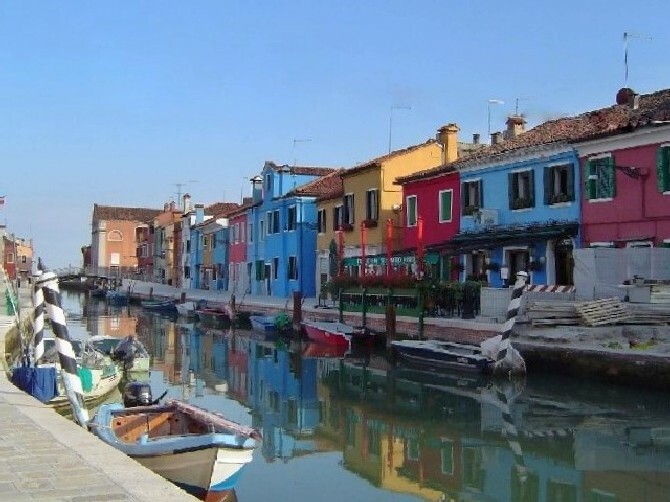 Here's a photo of Burano, the fishermen's village - the story goes that the fishermen paint their houses in bright colours so that they can identify them from a distance. Inspired by Aria (an animated televesion series which takes place in the city of Neo-Venezia, which is based on Venice), "X10A_Freedom" floats into Venice through the Alps on an easyJet flight (whose service he described as "excellent"). X10A_Freedom was dissapointed with Venice (putrid water, derelict houses, run-down, graffiti, consumerism and getting ripped off on a gelato purchase). His highlights were his trip on a Traghetto, the beauty of the Grand Canal and the photos he ended up with. Anthony took tons of photos of Venice, the gondolas, Saint Marks Square, the Doge's Palace, the Rialto Bridge and this one below of Venice's graveyard. Vanessa got her inspiration to visit Venice from the Venetian Hotel in Las Vegas, and from her base in the Czech Republic she caught a budget airline flight from Prague to Venice-Treviso. 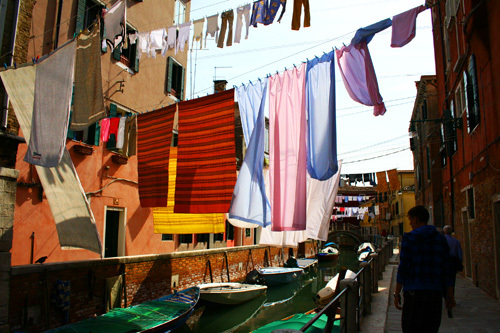 Armed with a litre of wine, she explored and photographed Venice. 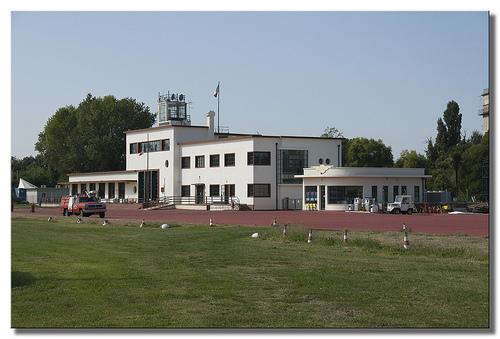 Sally and Paul wanted to fly their own aircraft to Venice and found Venice Lido Airport (better known as Nicelli Airport), which is a grass strip at the end of Lido Island on which one can land one's plane. A lifestyle I can only dream of, but an interesting posting nevertheless. Jonathan visited Venice & wrote a documentary-style journal of his visit there, which he summarises as "expensive & no cars, just boats" - not a bad summary. From his base at Lido (Mallomoco) he travelled to Venice and identified St Mark's Cathedral and the Rialto Bridge. Tells the story of interesting characters met in Venice following the fire which burnt down the Fenice Theater, and the characters' reaction to the fire. "La Cucina Veneziana: the Food and Cooking of Venice"
An author holidays at the Grand Hôtel des Bains on Venice's Lido Island, where he develops an obsession with a beautiful boy. The story was later developed into an opera and a film. A young Venetian needs to borrow money to finance his travels to go and woo Portia, and turns to a moneylender, who has some strange conditions. Set in Venice, Italy and Venice California, this tells the story of how Dean has to make up his mind between two women. A compilation of an animated TV series taking place in Neo-Venezia, which is based on Venice in terms of architecture and atmosphere. Work your way up the hierarchy from craftsman to the Doge of Venice, whilst forming alliances and winning over the hearts of Venetians with your genourosity, at the same time as enjoying the history of Venice. A few minutes before midnight the controversial Constitution Bridge is opened, becoming the first new bridge in Venice in 70 years (and the fourth to cross the Grand Canal). The mayor (Massimo Cacciari) thanks the builders and surprised tourists are the first to cross. 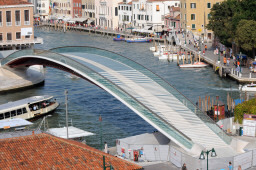 The bridge is named after the Italina constitution, which celebrated its 60th anniversary earlier in September. The gates to the Jewish ghetto in Venice are torn down. Nanda Bayin, a Burman king, is reported to have laughed to death when told, by a visiting Italian merchant, that "Venice was a free state without a king". 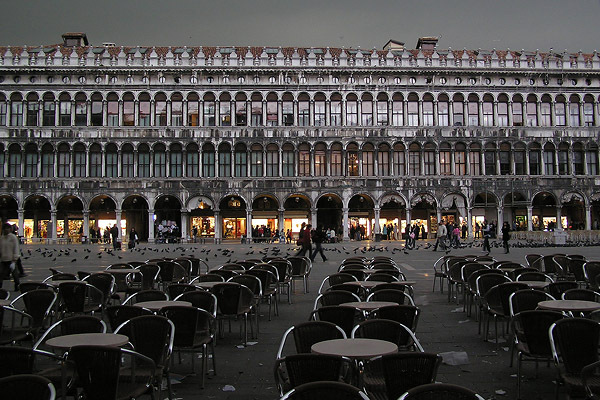 The Venetian Plague is believed to be spread by vampires. 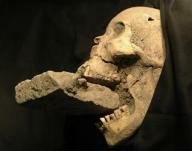 In 2009 Italian researchers discover the remains of a female buried with a brick jammed in her mouth - the first time archaeologists have uncovered the ritiual exorcism of a "vampire" (a brick would have been shoved in her mouth to prevent her feeding on people). The shrounds covering the head of a corpse often decayed at the mouth due to bacteria there, exposing the teeth, and the corpse was thought to be feeding on the shroud - to kill the vampire one had to remove the shroud and put something uneatable there, like a brick. 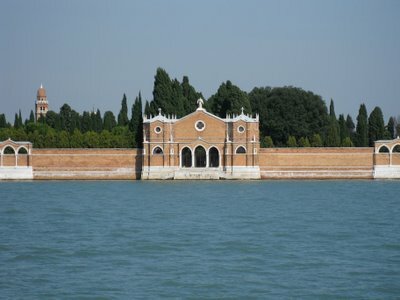 The remains were found in a mass grave in Lazzaretto Nuovo (some 3km north of Venice). St Cajetan founds a hospital in Venice for victims of incurable disease. Venice is serviced by two airports, the primary one being the Venice Marco Polo Airport, and the other being Treviso Airport (20km from Venice). Ryanair operates flights to the Treviso Airport from London-Stansted & Dublin. There are a number of hotel options on the mainland (e.g. Hotel Ducale near the airport).